Here I will explain what is encryptbypassphrase and decryptbypassphrase functions in sql server. By using these functions we can encrypt or decrypt string or text or password column in sql server. EncryptByPassPhrase function in sql server will encrypt the data and store it in varbinary format and DecryptByPassphrase function will decrypt varbinary encrypted string and show the result in decrypted format. In previous articles I explained SQL injection attacks with example, SQL Server interview question and answers, joins in sql server, function example in sql server 2008, Primary key constraint in sql server, foreign key constraint in sql server, cursor example in sql server and many articles relating to SQL server. 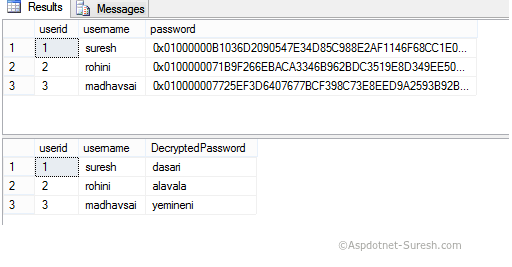 Now I will explain use of encryptbypassphrase and decryptbypassphrase functions with example in sql server. This function will use DES algorithm to encrypt the data and store it in varbinary format. If you observe above syntax EncryptByPassPhrase has two mandatory arguments: PASSPHRASE (specifies the data string that is used to derive an encryption key) and text (specifies text to be encrypted). DecryptByPassphrase is used to decrypt the encrypted column. If you observe above syntax DecryptByPassphrase has two mandatory arguments: PASSPHRASE (this string is used to derive decryption key this string should be same as encrptbypasspharse 'PASSPHRASE' string) and text (specifies text to be decrypted). If the encryption/decryption occurs on the Sql Server then somebody could easily intercept your traffic to and from and sniff out the cleartext. They could then steal your database and decrypt the columns because now they also have the passphrase. The targeted column(s) should be encrypted at rest and also in motion.